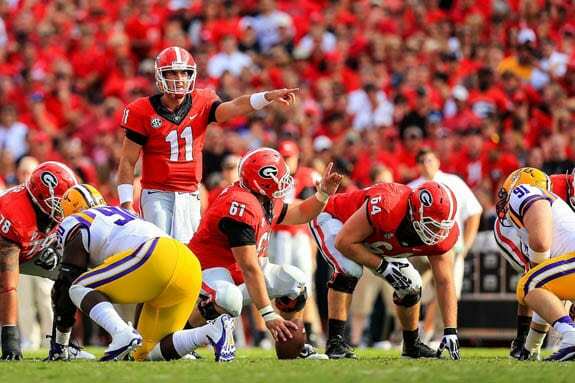 Aaron Murray threw four touchdown passes and ran for another to lead the ninth-ranked Georgia Bulldogs over the sixth-ranked LSU Tigers 44-41. Murray finished the game 20-of-34 for 298 yards. For his efforts, he was named the Walter Camp Offensive Player of the Week. His most important touchdown came late in the 4th quarter with the Dawgs trailing 41-37. Murray found Justin Scott-Wesley wide open on the right sideline and connected on the touchdown to give the Bulldogs a 44-41 victory. For the first time this season, someone other than Todd Gurley led the Dawgs in rushing — Keith Marshall. He rushed 20 times for 96 yards while Gurley finished with a respectable 73 yards on only eight carries. Chris Conley led the Bulldog receivers with 112 yards on five receptions. Justin Scott-Wesley, who caught the winning score, had four receptions for 55 yards. Arthur Lynch, Michael Bennett, Reggie Davis, Todd Gurley Rhett McGowan, Jay Rome, and Keith Marshall also caught passes from Murray. Overall, Georgia racked up 494 yards of total offense — 298 yards passing and 196 yards rushing. The defense continued to give up lots of yards (449) and points (41), but they made the stop at the end when the game was on the line. The D was also able to get in the backfield several times, sacking LSU quarterback Zach Mettenberger four times and recording several tackles for loss. Up next for Georgia is a trip to Knoxville to take on the Tennessee Volunteers on Saturday, Oct. 5. The game will be televised by CBS at 3:30 p.m. ET.